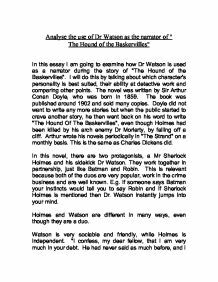 Analyse the use of Dr Watson as the narrator of " The Hound of the Baskervilles" In this essay I am going to examine how Dr Watson is used as a narrator during the story of "The Hound of the Baskervilles". I will do this by talking about which character's personality is best suited, their ability at detective work and comparing other points. The novel was written by Sir Arthur Conan Doyle, who was born in 1859. The book was published around 1902 and sold many copies. Doyle did not want to write any more stories but when the public started to crave another story, he then went back on his word to write "The Hound Of The Baskervilles", even though Holmes had been killed by his arch enemy Dr Moriarty, by falling off a cliff. Arthur wrote his novels periodically in "The Strand" on a monthly basis. 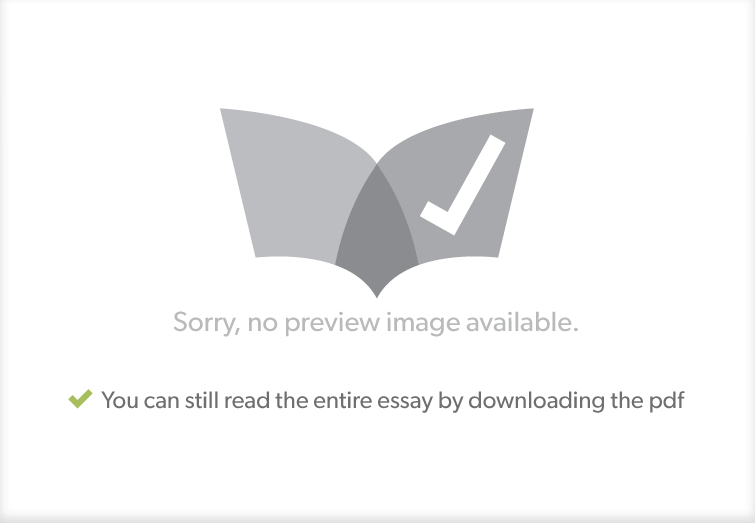 This is the same as Charles Dickens did. In this novel, there are two protagonists, a Mr Sherlock Holmes and his sidekick Dr Watson. They work together in partnership, just like Batman and Robin. ...read more. "Here are your reports, my dear fellow, and very well thumbed, I assure you. I made excellent arrangements, and they are... extraordinary difficult case." This shows that Watson is a reliable character because he wrote to Holmes on a regular basis and felt disappointed that his work had been a waste of time. Another useful quote is "My dear fellow, you have been invaluable to me in this as in many other cases..." This proves that Watson has been a solid and very reliable helper over a long period of time. I don't think that Sherlock Holmes would be able to succeed in solving the crimes without Watson, because he helps pointing out simple clues and helps with undercover detective work. Dr Watson is a good narrator to the story because he cannot make sense of the clues, just as the reader can't. Watson suggests, "There is the friends of the CCH. I should guess that to be the something Hunt, the local hunt to whose members he has possible given some surgical assistance, and which has made him a small presentation in return." ...read more. He would also be more interested in just writing the facts down, so the audience would just become clueless about piecing the facts together as it would probably just be clues dotted around on the page. The last but most no means least reason to me, why Watson is the suited character is that, when Holmes had worked out the murder and the villain, he would tell you straight away. This would be unexciting for the reader because it would end up more like a documentary rather than a thriller because there would be a lack of suspense for the finale. In conclusion to what I have written, I think that Dr. Watson is best suited to the part of narrator. He helps us understand the novel because he does not use scientific words, that ordinary people would not understand. Pointed out how Holmes and Watson are different. Like Watson being a solid, friendly, reliable and useful. While Holmes would come across arrogant, patronising and too scientific. Overall I think that I have met my aims because I have proven all my points with a quote and an explanation or comment. ...read more. The master-side kick relationship that Holmes and Watson share has become very famous. It is now the first image that comes to mind when talking about famous duo's and double acts. Others such as Starsky and Hutch, Tom and Jerry, Shaggy and Scooby are never thought of before Dr Watson and Sherlock Holmes. It seems, that as the residence of Holmes, any visitor who comes to call will only be a witness to what Holmes does normally, that he doesn't stop his affairs for anyone. In chapter six, the setting switches to Dartmoor and their journey through the moors of Devonshire before reaching Baskerville Hall. was it, maybe, even more compelling compared to then, due to a more constrained society (? ), than today, therefore was the read more compelling by comparison to todays reader. Consequently the setting of a story could enhance a mysterious aspect, (effectively, moreover). &amp;quot;Holmes Is Made Possible By Watson&amp;quot;. For example where it says in 'The Speckled Band', "There is no mystery, my dear madam", said he, smiling. "The left arm of your jacket is splattered with mud in no less than seven places. The marks are perfectly fresh.